Had a chance to see a screener of Django Unchained Tuesday night, and I was very impressed; great movie. 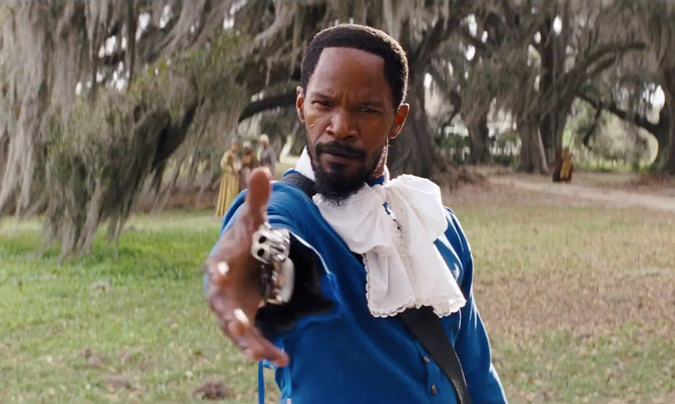 Set in the South two years before the Civil War, Django Unchained stars Jamie Foxx as Django, a slave whose brutal history with his former owners lands him face-to-face with German-born bounty hunter Dr. King Schultz (Christoph Waltz). Schultz is on the trail of the murderous Brittle brothers, and only Django can lead him to his bounty. Honing vital hunting skills, Django remains focused on one goal: finding and rescuing Broomhilda (Kerry Washington), the wife he lost to the slave trade long ago. Django and Schultz’s search ultimately leads them to Calvin Candie (Leonardo DiCaprio), the proprietor of “Candyland,” an infamous plantation. Exploring the compound under false pretenses, Django and Schultz arouse the suspicion of Stephen (Samuel L. Jackson), Candie’s trusted house slave. The movie was fairly predictable in that you had no doubt it was a Quentin Tarantino film. It had the violence and bloodshed, the cinematic elements, the melee, crazy costumes and even crazier scenarios. The transitions and soundtrack are typical as well, but with Tarantino typical typically also means awesome and Django Unchained is no exception. You should probably know by now if you like Tarantino films and really that’s all you need to know in order to decide if you should see this one or not. The acting was excellent too. We know Jamie Foxx, Leonardo DiCaprio and Samuel L. Jackson are great actors, but Christoph Waltz did an amazing job in his role of the ruthlessly apologetic bounty hunter Dr. King Schultz as well. The movie is listed as a drama and a western, but it has plenty of humorous moments as well. Not least of which is a scene with Jonah hill and a Klan wardrobe malfunction, or pre-Klan since 1858 may have been too early for them. The music is wonderfully anachronistic and hilarious. I know there are allusions to other westerns, like Blazing Saddles, but having not seen many westerns I couldn’t point them specifically but I could sense a familiarity to the dialogue and the audience chuckles gave it away. The plot itself starts with Django being rescued and then spends some time with the bounty hunter bit and character development before it takes off to Candie-land in a Bondesque infiltration mission to find, rescue, and free Django’s wife Broomhilda; this is where DiCaprio and Jackson come in. The events are mostly predictable, but it doesn’t take anything away from the movie and you’re kept wonderfully entertained and in suspense about what’s happening. It seems like many movies are earmarked for at least awards nominations before they’re even completed these days. It comes off as an inner-circle a popularity contest sometimes, but Django Unchained was probably the best movie I’ve seen all year, so I’ll be happy to see it get that type of recognition. The human mind fascinates me. It has the ability to string together trains of thought in order to connect things that are seemingly completely unrelated and in no way similar. Due to external stimuli an innocent phrase can stimulate memories and senses that haven’t been thought about or experienced in decades. Try walking back into your high school or another spot you spent a lot of time when you were younger. The memories that flood back are things you probably haven’t even though about since you were there. A billboard may remind you of a paper you wrote for English class that got hung up in praise, reminding you of the work and effort you put into it. A bank of lockers may remind you of a girl or guy you had a crush on and even though you can’t remember their last name you remember the color of their eyes and the way they wore their hair 20 years ago. Those are ordinary, visual, connections. Today I sloshed some coffee out of my cup as I was retrieving it from the cup holder as I got out of the car. The scalding liquid splashed a little on my hand, burning me, and I muttered “of course” to myself in a woe-is-me belief that misfortune was coming for me and of course I burned myself on my coffee. My next thought was immediately, “no one can talk to a horse of course. That is, of course, unless the horse is the famous Mr. Ed.” This song was complete with the lyrics and melody and a faint memory of the black and white TV show intro that I used to watch when I was little on Nick at Nite but probably haven’t seen in 10 years. I probably say ‘of course’, or hear it said, multiple times every day and it doesn’t trigger this memory. So what was so special about this one time that my mind formed this instant connection from a phrase muttered off-hand to myself to a TV show that was seemingly the furthest thing from my mind? I’ve got a couple of ideas. Earlier in the day I had cause to come up with a random word, and the word I chose was zebra. The horse on Mr. Ed was actually a zebra due to training issues with the original horse cast to play the role. This seems like a tenuous connection at best, but was the random phrase enough to bump Mr. Ed higher up in my consciousness in order to latch onto the “of course” I uttered later? Perhaps. Another possibility could be that horses were on my mind due to a mention of cavalry in battle in the audio book I was listening to that morning. They were actually faerie horses, but horses are horses after all. Perhaps that’s what bridged the connection. I’m always fascinated by these “Where’d that come from? !” moments our brains toss our way. This one in particular had me smirking in amusement, and now I have the urge to watch an episode of a 1960s television show. One sign of age is noting what teenagers these days would not get. You noticed these more and more as you get older I imagine. I was struck by a Met Life ad recently, in which Lucy from Peanuts suggested that insurance should be five cents to which the guy responded, not everything can be five cents. I started to wonder if kids these days would get the reference. Peanuts still runs in most newspapers, but who really gets newspapers anymore, and do kids read the funnies? It seems like a timeless classic, but I was struck with the thought that it just might not be. It wouldn’t be the first time. If you’re a teenager do you/did you get it without looking it up? (Try “Lucy, Peanuts, five cents”) If you’ve got a teenage kid, ask them if they get it. I watched the Back to the Future trilogy this weekend. Great movies, and modern classics. It got me thinking about those truly classic movies that people talk about, and quote and reference, forever. Another good example is the Princess Bride. In the latest Dresden Files novel by Jim Butcher, Harry references the classic quotes “Never start a land war in Asia, and never go against a Sicilian with death on the line”. So what were the last classic movies? The Matrix in 1999, Gladiator in 2000 both probably qualify. If you’re willing to considered animated, which you probably should, I think Shrek in 2001 qualifies as a classic. Finding Nemo is another one to consider from 2003. I’d like to mention that Harry Dresden references The Matrix in the latest book as well. I don’t count movies based on books. The Lord of the Rings movies were great, but they were part of the a greater set of lore than just a movie. Some of the comic book movies, like Spider Man, have been great but are part of something bigger. Another movie, or movies, that I’m on the fence about is Kill Bill. Great movie in my mind but I don’t think it has quite the mainstream staying power that a true classic would have. Quentin Tarantino is a well known and famous director, but the violence and target audience make it more of a cult classic than a mainstream one. I want to include Avatar, but even though it made so much money and everyone saw it it was more about special effects than it was about the story itself. Without an interesting and captivating story, I don’t think a movie can count as a classic. So that’s that. I think you can make a very strong case that the ‘reigning modern classic’ is about a fish lost in the Pacific Ocean. Revenge is a new series on ABC about a young woman who inherited a fortune from her father who was convicted of a crime in which he didn’t commit. She’s using the money to get revenge on all the rich folk who helped set her father up. The show takes place in the Hamptons where all these people spend their summers. The first scene takes place at the end of the summer, and it seems this season will be what happened to lead up to that scene. This format is interesting; not a ton is revealed in that first scene, but enough to create a sense of impending doom. You know the season is caroming towards this crazy ending, but you don’t know why or how. Emily VanCamp stars as Emily Thorne/Amanda Clarke and systematically take revenge on some of the bit players behind her father’s set-up from a psychiatrist to a big-name investment broker. She utilizes her money, her friends, and the skills gained since childhood to attempt to completely ruin these people’s lives, and often very publicly. I’m quite enjoying the power-play between the “Queen of the Hamptons” and Emily Thorne, who’s new to the Hamptons and is making quite a name for herself while secretly taking down the architects of her father’s demise. Breaking news is supposed be news that’s suddenly occurring like a plane crash or unscheduled and still developing. The term implies that the news is coming in as it’s being reported, something that’s becoming quicker and quicker in today’s social media society. However you often see the term used for things that are not breaking news. The other day the TV said, “Breaking: Congress to vote on jobs bill”. A scheduled vote is not breaking news; it’s not a surprise or an unexpected twist in a story. It’s possible to prepare a broadcast for this vote in advance, which makes it simply news. People were discussing the vote, and the implications of the vote, well before I saw this on the television last night. Additionally, followup news stories to breaking news are no longer breaking news. If President Obama announces a press conference in the afternoon for 8pm, that’s breaking news because it’s altered the daily schedule and no one was prepared for it previously. When 8pm rolls around it’s no longer breaking news, it’s a followup story. If the president says something that’s new, such as “We’re going to bomb Mordor”, then it becomes breaking news. If he’s merely updating the status of an existing war, or discussing the progress of a bill, it’s not breaking news. The overuse of the term breaking news is an egotistic one. The news media suggesting that their stories are so important that they preempt everything going on at that time is arrogance at it’s finest. It’s also a boy who cried wolf scenario: artifically creating hype for non-critical stories lessens the impact of truly breaking news. The story should create the hype, not the other way around. Breaking news also implies that there is something new. If you portray a story as breaking, it should be bringing the audience new information that’s developing in real time. If you’re recapping something that’s been being discussed on the Internet for hours, you better be bringing something new to the discussion or clearing up rumors with hard facts. I get a kick out of spotting specific craft beers (And non craft beers) in movies and television shows even though they often try to not to specifically focus on the beer label. Sometimes you can even identify the city early by the beer. This happened in the movie “He’s Just Not That Into You”. An early scene features two people in a supermarket, and one of them is purchasing a six-pack of Clipper City and I knew it was set in Baltimore. 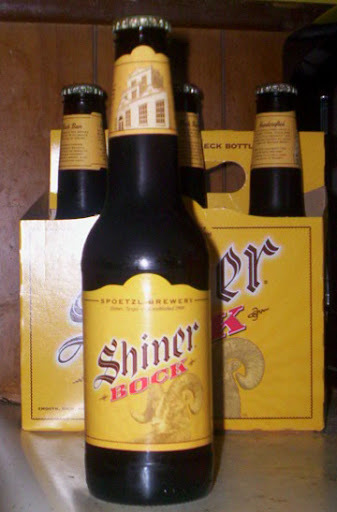 Most recently I spotted Shiner Bock, a famous Texas craft beer, on an episode of True Blood. (In Shreveport, LA) Alcide drank it with the pack leader Marcus. I have no idea what prompts the producers to use these beers. Perhaps someone on set is a beer lover and they reuse the empty bottles for the show. Maybe they’re looking for something with a little local flair and think it makes a fun prop and they want the character to be a craft beer drinker. Perhaps they’re just annoyed Budweiser turned them down for a sponsorship. Whatever the reason, whenever I see a different beer can or bottle on my television or in a movie I try to identify it. It’s a fun little game to play, although you shouldn’t forget to pay attention to what the characters are doing. I’ve had to rewind a show many times because of that.